Providing you the best range of is your bed safe and geopathic stress neutralizer pads with effective & timely delivery. Geopathic Stress has been known to lower the immune system of the person exposed to this dreaded stress energy. We talk about Geopathic Stress in your Bedroom/Bed, because that is the place where one spends more than 50% of one's life time.
" Restlessness, insomnia, difficulty in getting to sleep, excessive dreaming, excessively heavy sleep, waking un refreshed , waking up with head ache or back pain , Cold or restless feet and legs in bed, Asthma and respiratory difficulties in night, fatigue and lethargy in daytime, unexplained mood changes, aggression and depression, children bed wetting, children continuously crying, infertility , miscarriage, marital disharmony, premature death, cot deaths, aids, not responding to medications, prolonged illness and CANCER "
CANCER is the most notorious of these, and tumours are known to develop almost always at exactly the spot where two or more GS lines cross a person’s body as they lie asleep in their bed. Geopathic Stress does not cause an illness, but lowers your immune system, so you have less chance of fighting any illness. SCIENTIFIC STUDIES HAVE REVEALED THAT GEOPATHIC STRESS HAS BEEN THE MAJOR CAUSE FOR CANCER DEATHS. 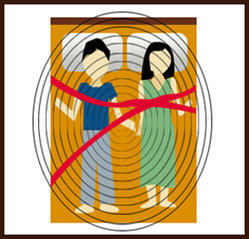 If any of the above mentioned symptoms are experienced by any or all the members of the house frequently , and/or any of the above mentioned occurrences take place, it will be very safe to assume that the house is affected by Geopathic Stress and more so the bedroom ( cot area) , where one spends half the life time. THEREFORE IF THE COT AREA IN THE BEDROOM WHERE YOU SLEEP IS MADE 'GEOPATHIC STRESS FREE ZONE' THEN YOU HAVE CERTAINLY PROTECTED YOURSELF AGAINST THE THREATS OF GEOPATHIC STRESS FOR LIFE TIME. The same theory holds good in respect of one's office or working place also where one spends considerable time. You can spread 12 Nos. Geopathic Stress Neutralizer Pads below your Mattress and do away with Geopathic Stress Instantly and permanently. PRICE IN INDIA : Rs 3000 per set of 12 Pads including courier charges. PRICE OUTSIDE INDIA : USD 180 per set of 12 Mats including UPS courier charges. Note: For more information on Geopathic Stress Neutralizer Pads click the product heading "Geopathic Stress Neutralizer Pads" elsewhere in this website. The word “Geopathic” is derived from the Greek words, “Geo’ meaning ‘the Earth’, and “Pathos” meaning‘disease’ or ‘Suffering’, so literally ‘ suffering of the Earth’. The term ‘Geopathic stress’ is used to describe negative energies, also known as ‘harmful earth rays’, which emanate from the earth and cause discomfort and ill health to those living above. Earth energies can be bad, good or neutral. When a structure is built above underground water, the natural magnetic flow of the water energy is restricted, and disruptive vibrations are set up in the building. 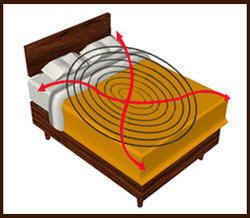 Thus if we sleep over these flows over a period of time, body's natural resistance to diseases can be affected. Geopathic Stress is the cause of many different illnesses which are frequently stress related and difficult to diagnose. If you or your family members experience any of the below mentioned symptoms / occurances frequently ,then you can safely assume that you are sleeping in a Geopathically stressed bedroom and you need to take corrective action immediately. Geopathic Stress does not cause an illness, but lowers your immune system, so you have less chance of fighting any illness.
" Restlessness, INSOMNIA , difficulty in getting to sleep, excessive dreaming, excessively heavy sleep, wakingup unrefreshed , waking up with head ache or back pain , Cold or restless feet and legs in bed, Asthma and respiratory difficulties in night, fatigue and lethargy in daytime, UNEXPLAINED MOOD CHANGES, AGGRESSION AND DEPRESSION, children bed wetting, children continuously crying, INFERTILITY, MISCARRIAGE, MARITAL DISHARMONY, premature death, cot deaths, aids, not responding to medications, prolonged illness and CANCER ". How we Relieve you from Geopathic Stress ? After years of research, we have come out with a very effective and highly energized 'Geopathic Stress Neutralizer Pad' to completely Neutralize the Geopathic Stress effect on the Cots/Beds , where one spends more than half his/her life time. Apart from using the Vedic Prescriptions in its creation, these Pads are also permanently embedded with the Earth’s Natural Frequency of 7.83Hz which enables your body to enjoy the optimum immune levels. These Pads come in a size of 18 inches x 12 inches each and packed in sets of 12 pads for a Double Cot.These Mats have to be spread on the Cot just below the mattress.When this is done, Geopathic Stress zone is completely Neutralized immediately and the Cot becomes safe to sleep. These Pads are laminated and are dust proof, water proof , tear proof and retain their power for life time. One can feel the beneficial effects of GS Neutralizer Pads mostly on the very same night of installation, when one experiences a very sound ,stress free and an undisturbed sleep, free of Geopathic Stress. However the results may vary from person to person depending on the strength of the individual’s immune system. Looking for Geopathic Stress Neutralizers ?